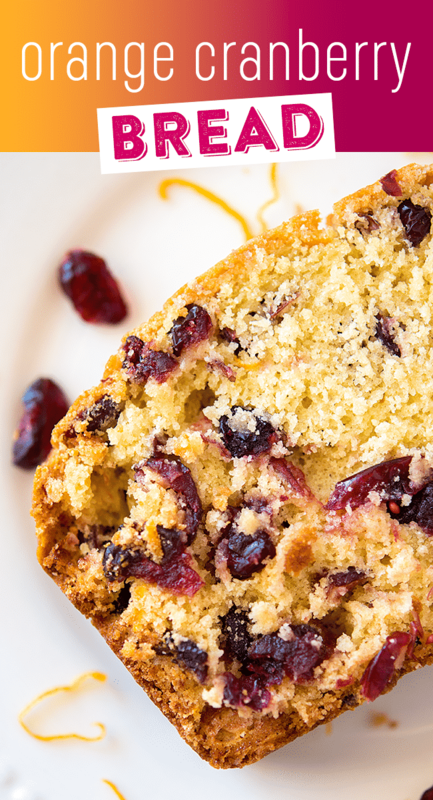 Our easy orange cranberry bread is easy to make and tastes absolutely delicious! I can’t resist the flavor and aroma of oranges in any recipe! 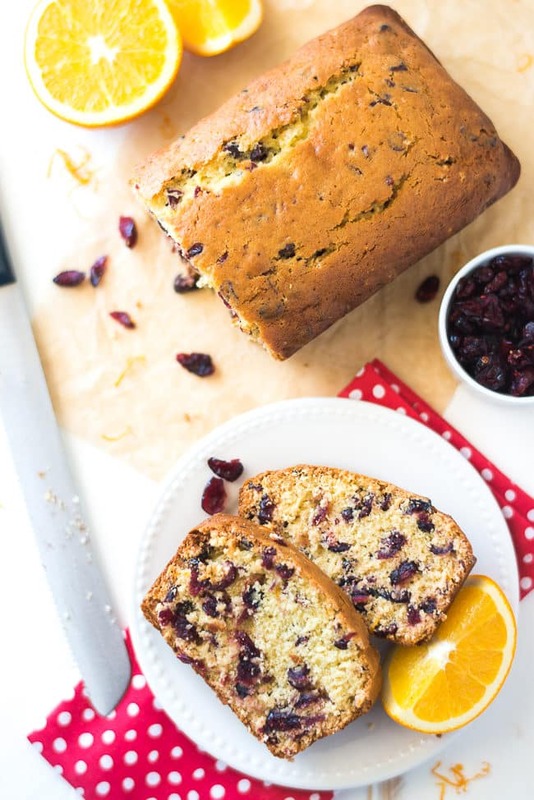 This orange cranberry bread recipe uses a whole cup of orange juice, and that, along with orange zest, gives it an incredible moistness and delicious flavor. 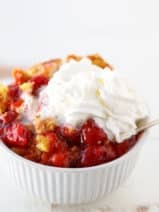 I’m also a pretty big fan of cranberries. 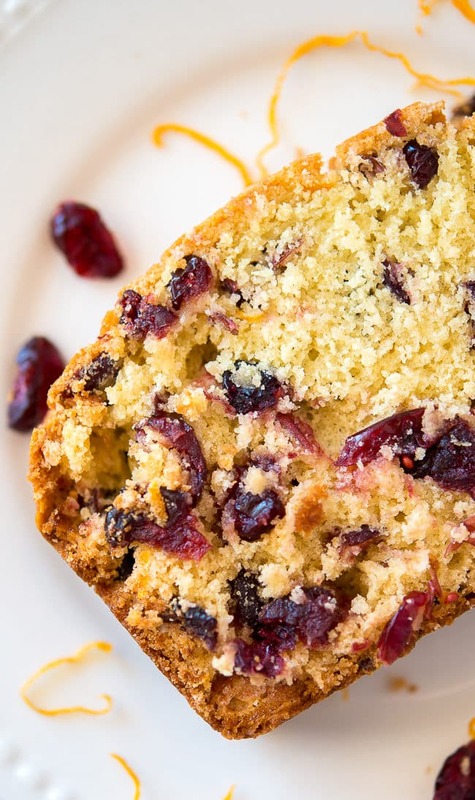 You could certainly use fresh cranberries in this bread recipe, but since I almost always have dried cranberries in my pantry, they are an ingredient I turn to quite often in bread and muffin recipes. 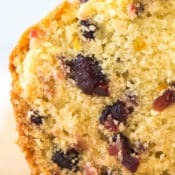 I used a whole cup and a half of dried cranberries in my orange cranberry bread, but you can certainly cut back if you think that’s too much for your taste. This bread is definitely sweet enough to pass for a dessert, but it also makes a really nice addition to your breakfast or brunch. Plus, it’s just so pretty. I love the colors! 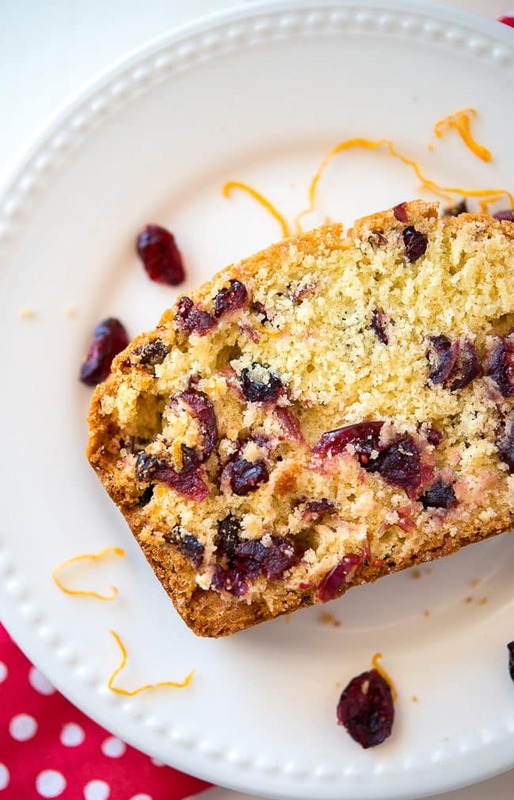 I’ve mentioned a few of the wonderful ingredients in this delicious orange cranberry bread, but here’s the full rundown of items you’ll need to have on hand. It’s always an added bonus when your food looks just as great as it tastes. If you love easy bread recipes, don’t miss my amazing blueberry zucchini bread recipe! 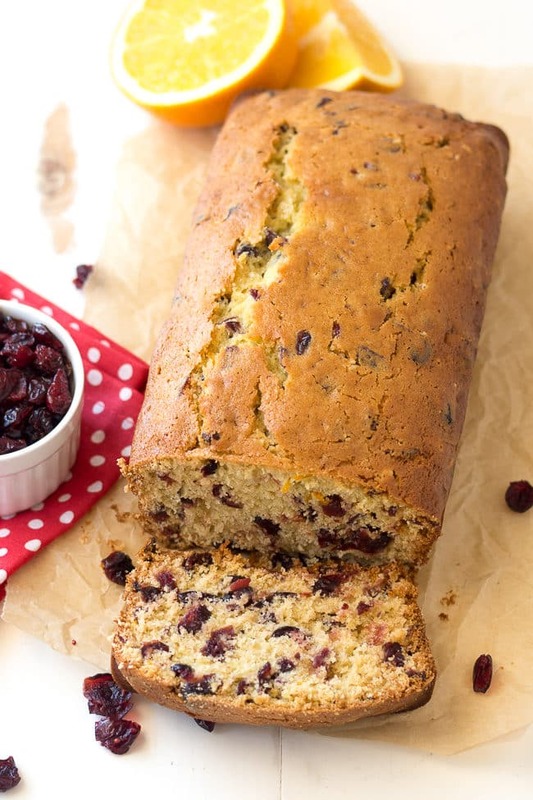 With the holidays on the horizon, I’m considering making some more orange cranberry bread to give away to friends and family. With all the cookies and candies floating around, I think that bread is a nice change and makes a perfectly divine holiday gift. Growing up, my mom always received an assortment of homemade bread from one of her clients (she was a hair stylist for 35 years). Mom would bring those little mini loaves of bread home every December, year after year. Each loaf was wrapped in red and green cellophane, and we all had our favorite flavor. I love thinking back on our Christmas traditions from years gone by! If you’re looking for more great holiday treats to bake and share this season, check out my raspberry almond shortbread cookies and this yummy cream cheese filled pumpkin bread. 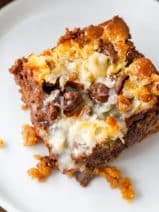 You’re also going to fall in love with my easy chocolate chip banana bread and our amazing banana chocolate chip muffins! 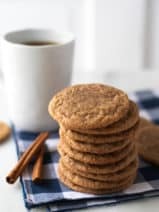 If you’re as forgetful as I am (I would lose my head if it wasn’t screwed on, seriously), you’ll definitely want to bookmark this recipe by sharing it your Facebook wall, or saving it to your favorite Pinterest boards. Of course, you can always print the recipe below. Preheat oven to 350 degrees F. Grease a 8 1/2 x 4 1/2-inch loaf pan. Combine your flour, sugar, baking powder, salt, and baking soda in a large bowl. Add melted butter, orange juice, orange zest, vanilla and egg; mix well. Stir in your cranberries. Pour the batter into pan. Bake in the preheated oven until a toothpick inserted into the center comes out clean, or about 60 to 75 minutes. I covered mine with foil the last 15 minutes of bake time to prevent over browning. Cool in the pan for 10 minutes before removing to cool completely on a wire rack. 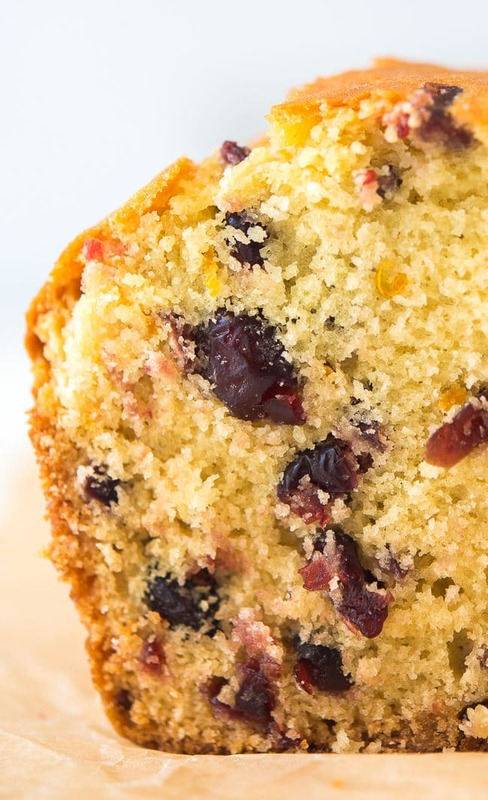 I love dried cranberries in my bread recipes, but you can certainly reduce the dried cranberries or use fresh cranberries if you like! 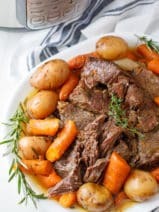 Thank you Crissy for the great recipe! This bread has a lovely taste. I followed the recipe and did not make any substitutions, but it was too much batter for this size loaf pan. If I make again, I will put about 2/3 of the batter in a loaf pan and turn the rest into mini muffins. Hope this helps someone else not have to clean up oven spills! 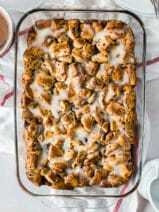 will have to try this making it gluten free, looks good! many of us are gluten free!